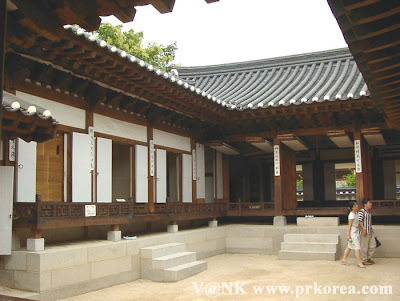 Hanok is Korean traditional house or architecture. It is nature-friendly. There are different Hanoks. And there are many more types. The most interesting and best part of Han Ok is Ondol. Ondol is a Korean heating system, which it was originated from the ancient kingdom of Goguryeo (37 B.C. ~ A.D. 668). It works bascially like this: a large stone under a living space. So, smoke from a fire is trapped under the stone and goes to the other side. Ondol system has a distinct advantage, which is that even if you remove the direct source of heat, there still remains the heat for a quite long time. However, one pretty dangerous disadvantage is that if an underfloor cracks so there is a gap, the smoke can rise up and cause 'carbon monoxide poisoning'. In addition, it takes a long time to heat up the floor to stay up a night. Nontheless, this Ondol system is proven to has high thermal efficiency and therefore an economical way to heat the house. Nowadays, this system has been modified to modern housing by spreading pipes under floors and circulating heated water through the pipes reducing dangerous essences that could happen in the past. Anonymous January 28, 2010 at 2:31 p.m. I am the sort of hombre who passions to try original things. Currently I am constructing my personalized pv panels. I am making it all alone without the assistance of my staff. I'm utilizing the internet as the only path to acheive that. I saw a truly amazing site which explains how to create solar panels and wind generators. The web site explains all the steps involved in solar panel construction. I am not sure about how precise the information given there is. If some people over here who have xp with these works can have a see and give your feedback in the thread it will be grand and I would extremely appreciate it, cauze I really would love to try [URL=http://apennootje.blogwogin.com/2009/11/10/solar-panel-construction-at-home]solar panel construction[/URL]. Anonymous February 2, 2010 at 6:47 p.m. Anonymous February 8, 2010 at 1:38 p.m.
Well I assent to but I think the brief should prepare more info then it has. Anonymous March 13, 2010 at 5:45 a.m. Anonymous March 15, 2010 at 1:05 p.m. Anonymous January 21, 2011 at 10:16 p.m. Anonymous February 4, 2011 at 5:08 p.m. Anonymous February 6, 2011 at 7:00 p.m. Anonymous December 9, 2011 at 2:35 a.m.
Is some one get a link to Hanok for sale in usable or renovate condition? Anonymous December 1, 2012 at 8:05 a.m. Anonymous December 13, 2012 at 6:17 p.m. Anonymous December 13, 2012 at 11:21 p.m. Anonymous December 13, 2012 at 11:40 p.m. Anonymous December 14, 2012 at 6:17 p.m.
here now and would just like to say thank you for a incredible post and a all round enjoyable blog (I also love the theme/design), I don't have time to read it all at the moment but I have book-marked it and also added in your RSS feeds, so when I have time I will be back to read a lot more, Please do keep up the great job. Anonymous December 14, 2012 at 9:49 p.m. Anonymous December 17, 2012 at 11:12 a.m. Anonymous December 18, 2012 at 12:58 a.m. Anonymous December 18, 2012 at 8:45 a.m. Anonymous December 18, 2012 at 9:28 a.m. Anonymous December 18, 2012 at 10:40 a.m. Anonymous December 18, 2012 at 9:31 p.m. Anonymous December 18, 2012 at 11:06 p.m. Anonymous December 19, 2012 at 12:59 a.m. Anonymous December 19, 2012 at 1:56 a.m. Anonymous December 19, 2012 at 11:50 a.m. Anonymous December 19, 2012 at 5:28 p.m.
his web research through the ideas he received out of the site. other people could have been making money from. And we discover we now have the blog owner to thank because of that. Anonymous December 20, 2012 at 3:02 a.m. Anonymous December 20, 2012 at 11:08 a.m. Anonymous December 26, 2012 at 11:22 p.m.
look easy. The whole look of your site is great, let alone the content material! Anonymous December 27, 2012 at 1:54 p.m. Anonymous December 29, 2012 at 9:07 a.m. Anonymous December 29, 2012 at 10:33 a.m. Anonymous December 30, 2012 at 6:29 a.m. Anonymous December 30, 2012 at 7:23 a.m. Anonymous December 30, 2012 at 11:16 p.m. Anonymous December 31, 2012 at 11:13 a.m. Anonymous December 31, 2012 at 12:53 p.m. Anonymous December 31, 2012 at 10:56 p.m. Anonymous January 23, 2013 at 7:39 p.m. Anonymous January 23, 2013 at 8:30 p.m. Anonymous January 25, 2013 at 2:46 a.m.
Generally I don't read post on blogs, however I would like to say that this write-up very compelled me to take a look at and do it! Your writing taste has been amazed me. Thank you, very nice article. Anonymous February 10, 2013 at 7:08 p.m.
thing that is needed on the internet, somebody with a bit originality. Anonymous February 11, 2013 at 3:10 p.m. Anonymous February 19, 2013 at 6:27 a.m.
certainly like what you're saying and the way wherein you assert it. Anonymous February 21, 2013 at 8:35 p.m. Anonymous February 25, 2013 at 12:27 p.m. Anonymous February 25, 2013 at 5:13 p.m.
matter, many of your opinions are quite radical. argument. In any case I did enjoy examining it. Anonymous February 26, 2013 at 1:02 p.m.
Hiya very cool blog!! Guy .. Beautiful .. Amazing . Anonymous February 26, 2013 at 1:33 p.m. Anonymous February 26, 2013 at 11:49 p.m. Anonymous February 27, 2013 at 8:25 a.m. Anonymous February 27, 2013 at 4:39 p.m. Anonymous March 1, 2013 at 2:36 a.m. Anonymous March 1, 2013 at 6:28 a.m. Anonymous March 6, 2013 at 12:23 a.m. Anonymous March 6, 2013 at 11:22 p.m. Anonymous March 7, 2013 at 1:16 a.m. Anonymous March 12, 2013 at 10:30 a.m. Anonymous March 15, 2013 at 5:51 a.m. Anonymous March 18, 2013 at 5:49 a.m. Anonymous March 26, 2013 at 11:55 a.m. Anonymous March 26, 2013 at 3:35 p.m. Anonymous March 27, 2013 at 11:29 p.m. Anonymous March 28, 2013 at 4:26 a.m. Anonymous March 28, 2013 at 12:23 p.m.
will have a link exchange agreement between us! Anonymous April 6, 2013 at 7:21 a.m. Anonymous April 7, 2013 at 9:27 a.m. Anonymous April 10, 2013 at 9:53 a.m. Anonymous April 10, 2013 at 8:41 p.m. Anonymous April 11, 2013 at 12:57 p.m.
market chief and a good portion of people will omit your wonderful writing due to this problem. Anonymous April 13, 2013 at 7:21 a.m. Anonymous April 23, 2013 at 10:36 p.m.
like my very own to learn very much more with respect to this problem. Anonymous May 18, 2013 at 10:56 p.m. Anonymous May 29, 2013 at 1:34 p.m. I think everything posted was actually very logical. But, consider this, suppose you composed a catchier title? I mean, I don't want to tell you how to run your website, however suppose you added a title that grabbed a person's attention? I mean "Hanok - Korean Traditional House" is kinda boring. You could look at Yahoo's front page and watch how they create article headlines to get people to click. You might add a video or a related picture or two to grab people excited about everything've written. Anonymous June 4, 2013 at 11:34 p.m. Anonymous June 6, 2013 at 7:04 a.m. Anonymous June 6, 2013 at 5:25 p.m. I've tried other brands like Weider and Soloflex and so they will not even appear close for the Bowflex concerning the quality and benefits. Anonymous June 7, 2013 at 7:05 p.m.
the decreased restrict of the target zone throughout a schooling session. Mrs SMITH STEPHANIE May 3, 2017 at 1:58 p.m.